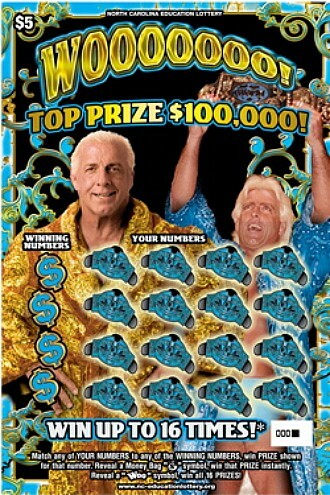 Having already signed on to wrestle Hulk Hogan in Australia, now former wrestling superstar Ric Flair is helping North Carolina hawk lottery tickets with their new “Wooooooooo” scratch-off tickets. It was particularly nice of the producers to provide Ric with that young chick as eye-candy, compared to him at least. I mean, he’s old enough to be her father. When he walks out of the curtain I’m amazed he didn’t snap his femur just walking. « Mama, Who Was That Masked Man?